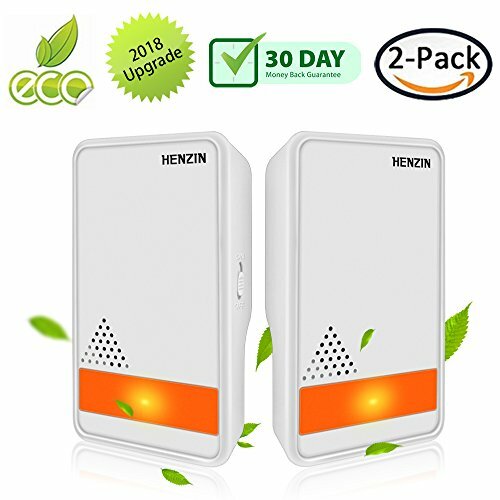 SAFE PEST CONTROL - With the newest ultrasonic technology to extremely irritate the hearing and the nervous system of the insects & mice to make them uncomfortable, HENZIN ultrasonic repeller drives pest away from your home and do not dare to enter your house any more. NO CHEMICALS - Unlike traditional pest control solutions, there\'s no more chemicals,no insecticides, no poisons. Without killing any insect or rodent, leaving no messy up for you to clean.This ultrasonic repeller will protect your home from pests without doing any harm to human body and your lovely pets. NO RADIATION - There is no radiation from ultrasonic repellent which will do harm to human body, it is safe for pregnant woman and baby to use. NO NOISE - This pest repellent is only audible to pests and rodents. Human and pets won\'t hear any sound. EFFICIENT - HENZIN repellent can be used in house, basement,garage,warehouse,and other storage area. 360 degree all-round deinsectization and protect over 1600 square feet. Made the ants go away! Got rid of the spiders!